So this is it. 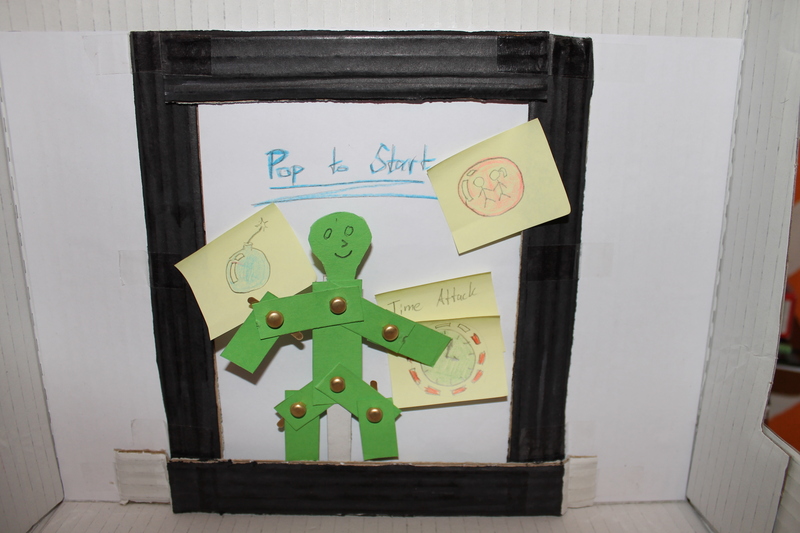 We finished our prototype and had to give our final presentation. Additionally we’ve made a video to get a general idea of our work 😉 You can have a look at it here. This week we were supposed to test our software prototype with real users. Before we actually did that, we further improved our prototype regarding a better background (more easy to discriminate bubbles and background), several hints for the user to make the game much easier to use (e.g. correct distance to the camera) and understand (e.g. countdown timer). Our test setup was the following. 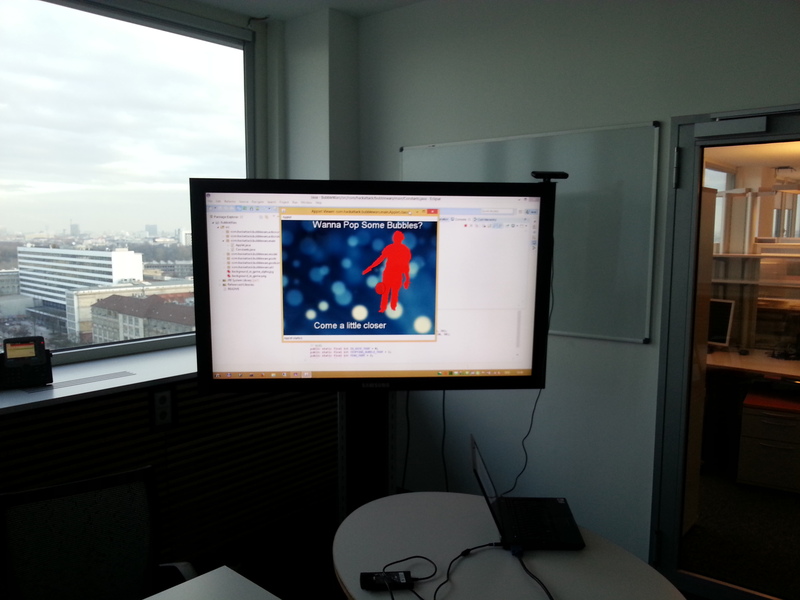 We used a conference room in the TEL building that has a particular big television (see photos below). We asked for some personal information (Gender, Age, Nationality, Profession, Prior Experience) and introduced our method as mentioned above. 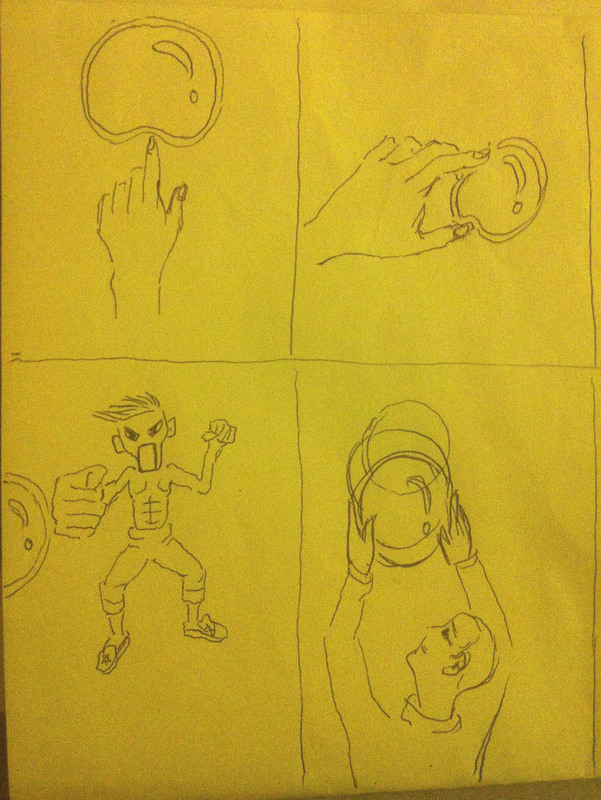 We recorded their thoughts with a smartphone and took notes while they were playing our game. No Experience with application area. 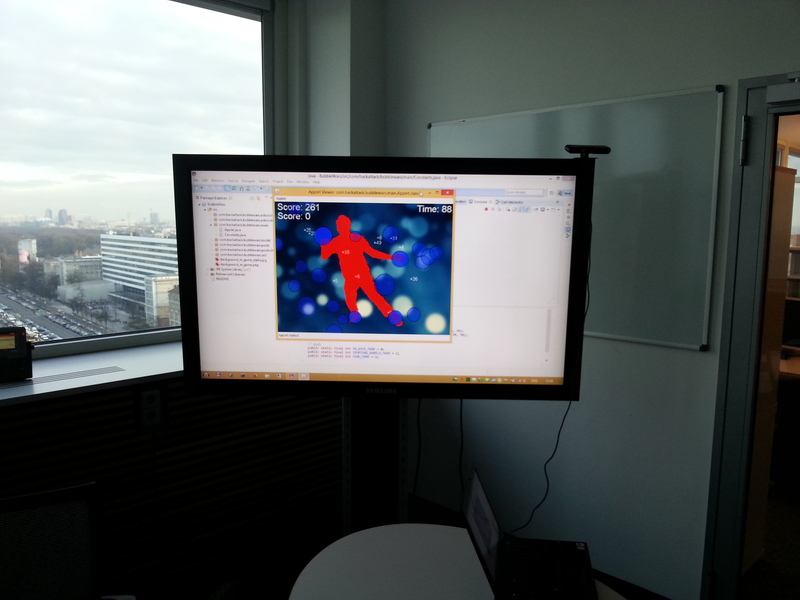 During the Christmas break we had to start with the real work – coding a prototype. We concentrated on the “initial tempting bubble”, the gameplay and an easy extendable and dynamic code structure (don’t worry – we didn’t spent too much time on the code structure – it’s a prototype after all). After popping the tempting bubble, the game starts. The “tempting bubble” does not move yet and doesn’t look very fancy, but it is a good start and easy to modify and enhance from now on. The game itself you can already play in quite a sophisticated way. You start with one type of bubble respectively one color. To pop the bubbles you can use your hands and feet which have the same color as all the bubbles in the beginning. 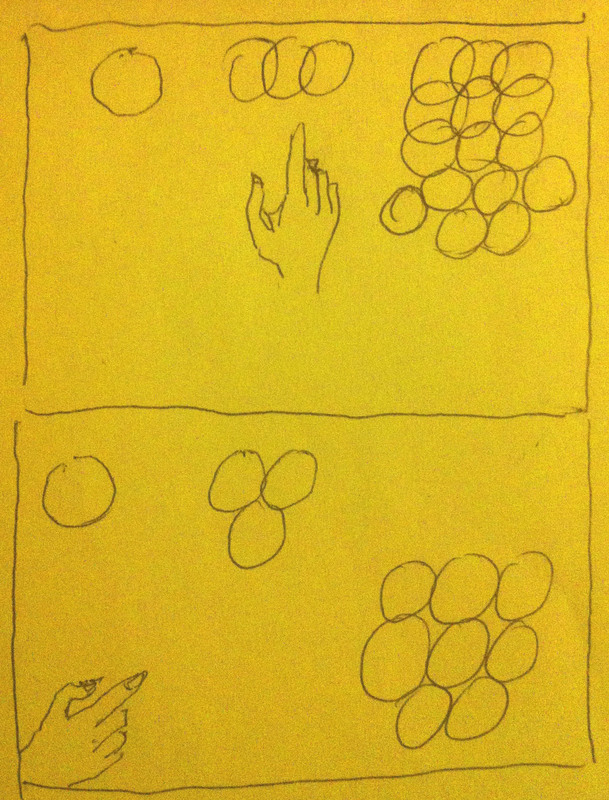 Originally we wanted to use pictures of colored comic-like limbs, but then it would have been quite complicated to match the orientation of the picture hands and feet with the actual hands and feet so we decided to change that to simplistic circles, which have a higher opacity than the corresponding bubbles. 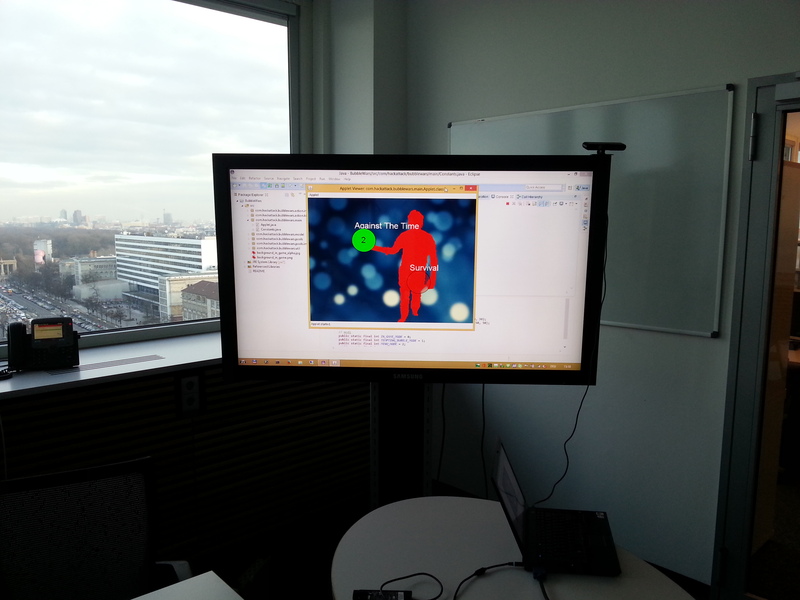 Therefore the user can still make the connection between the limb and the bubble. 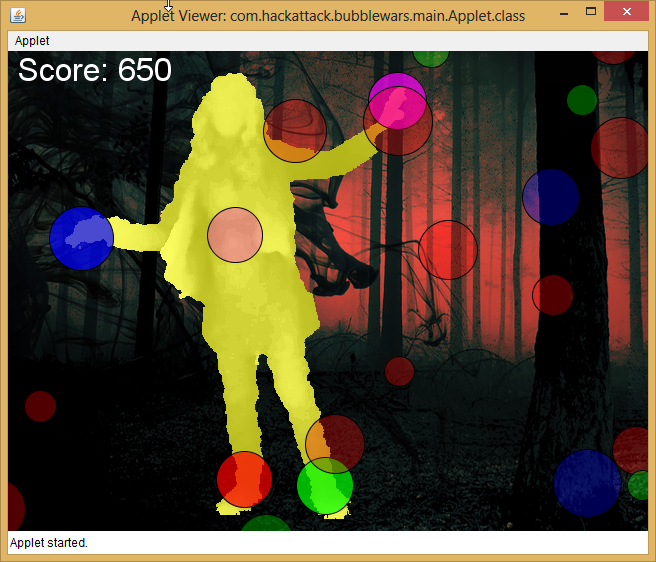 Right now, the user gets 10 points for every bubble he popped, although the hint for the player (like the gained points appearing where the bubble was popped) is still missing. Also the game will get more serious every 15 seconds. Serious means that the user gets a new color to pop bubbles with and new bubbles in that color will be generated accordingly. Until now there is no choice menu or game ending highscore screen, but these are very easy to add now, with the current code structure. The following screens show a little bit of the “tempting bubble” and the gameplay. 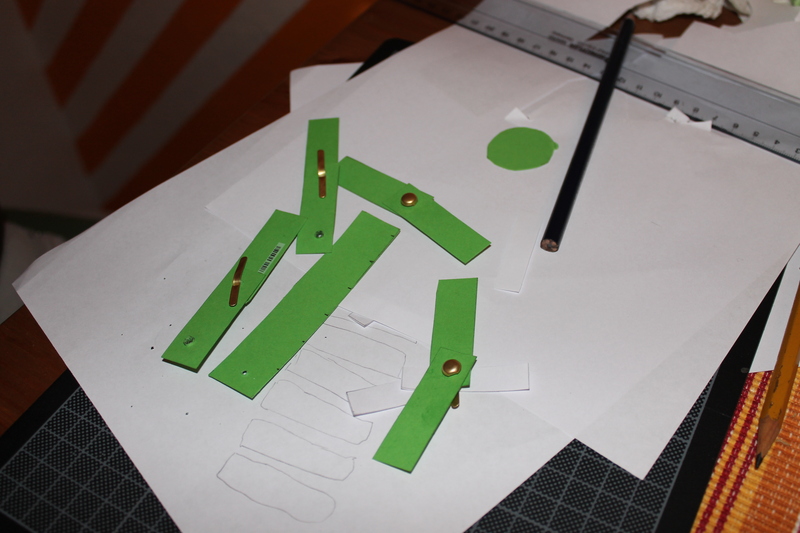 This time we had two weeks to use our paper prototype to do some user testing. Through these interviews we learned a lot about what we could enhance in our application. 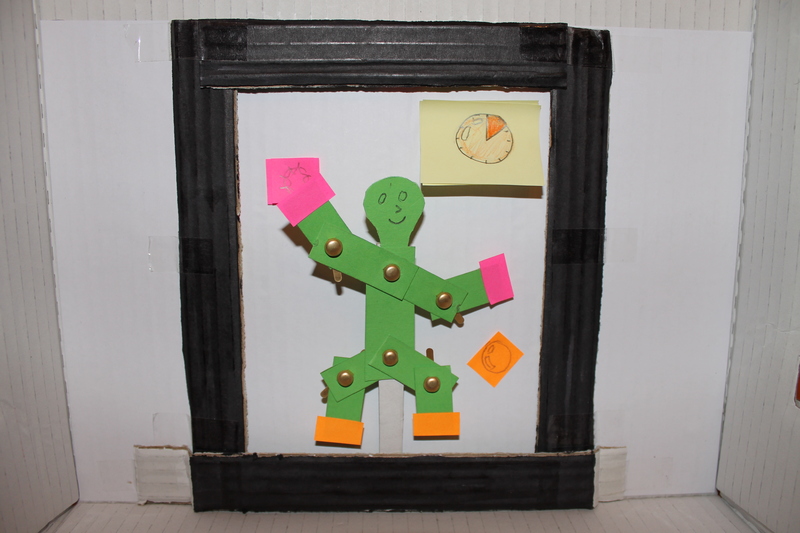 We upgraded our paper protoype according to user critics. The result can be seen in the pictures at the end of the post. All in all, the users seemed to like our gameplay, but were concerned that it is easy and quick to understand, so we should focus on making everything more self explaining. – Luring bubble should ‘follow’ the user’s shadow and take his/her form gradually (until user is close enough to interact with the next screen). – The user gets his hands and feet colored. Each bubble also has a color. You can only destroy bubbles, whose color is the same as the body part’s color that tries to pop it. 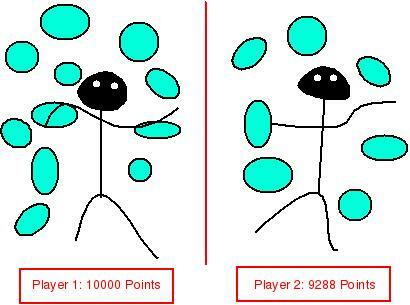 – Users suggested to create some kind of combo points if you popped three blue bubbles in a row for example. – To make the user understand the gameplay quick, we work with matching colors (bubbles vs. bodyparts) and we start with only one color, adding more over time. – We decided to get rid of a difficulty choice screen, and instead let the user choose a modi which he/she wants to play in. We got three modi: ‘Against the Time’ (destroy as many bubbles as possible in a certain time frame), ‘Survival’ (you must destroy every bubble in a certain time frame, otherwise you loose) and ‘Multiplayer’ (Two players play against each other – via time or survival mode). – In each mode, the user starts with a small amount of colors. Colors change over time and get more, in order to make the game gradually more difficult over time. – We decided to mark a zone on the screen and once the player enters it, a countdown starts ticking, indicating that a picture will be taken soon. – Only the top three will be displayed. 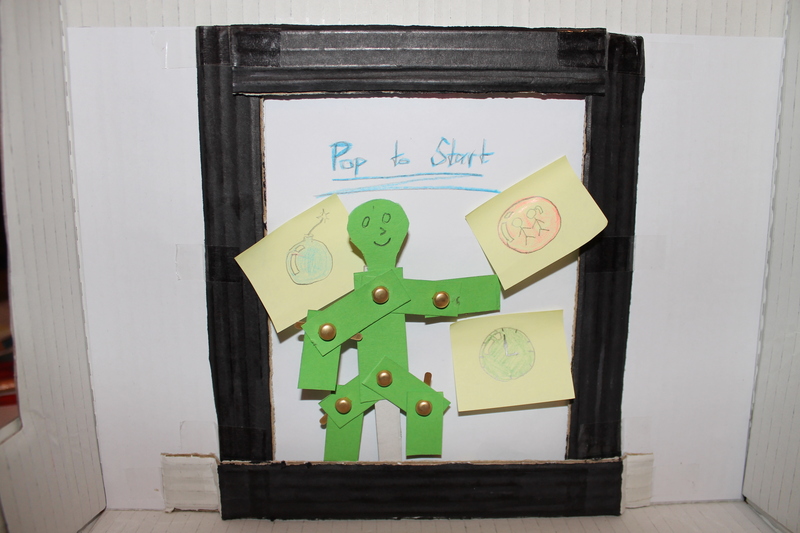 In the following you can see our revised Paper Prototype. 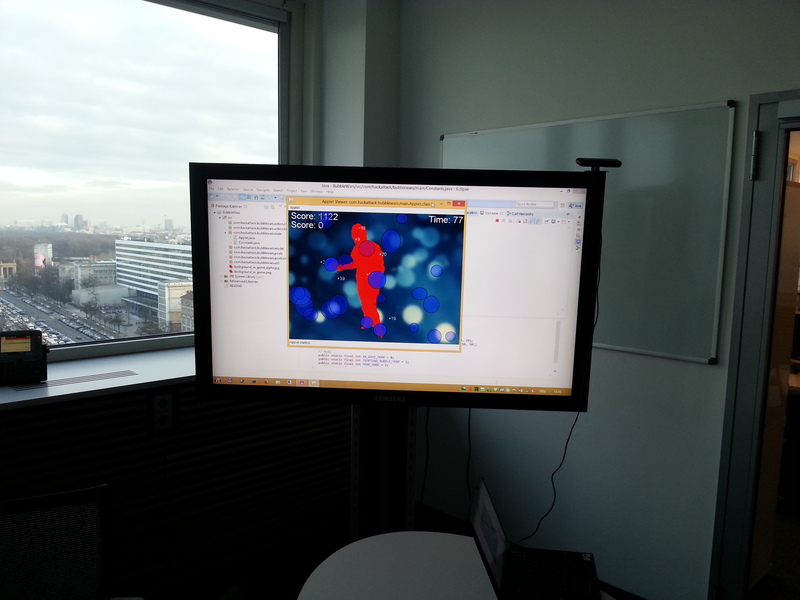 The first three screens display the luring bubble as it gets bigger, when a user approaches the screen. clock -> agains the time. If the player hovers a hand over one of the bubbles it displays a name to make clear what kind of mode it is (if the icons are not self-explanatory enough) and a timer will indicate that this game will start. This way the player can still decide to play another mode or at least really knows what kind of mode he is starting. 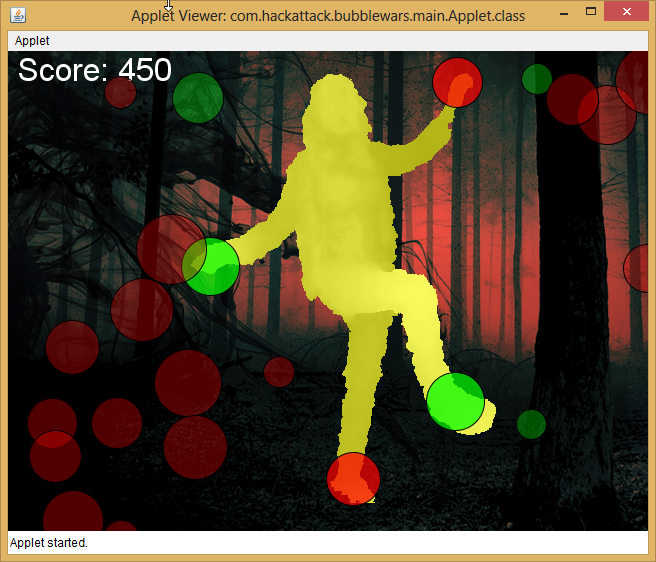 In our example the player chose ‘Time Attack’. There will be bubbles according to the colors of your hands and feet. (In the first screen the clock is missing!) If a bubble gets popped there will be an indicator for the gained points and a score counter (missing as well in the photos :X). Later there will be even more colors to make it more difficult. 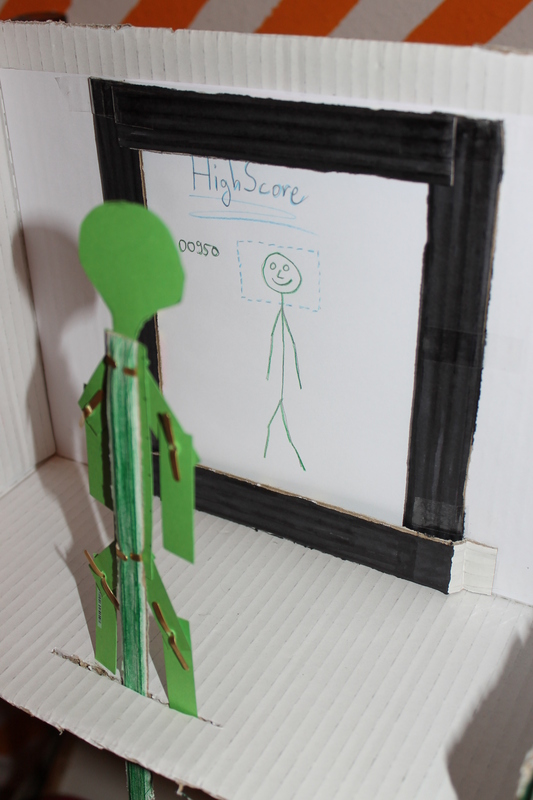 In the end there will be a high score screen and if the user entered the Top 3 he can take a picture of his shadow. 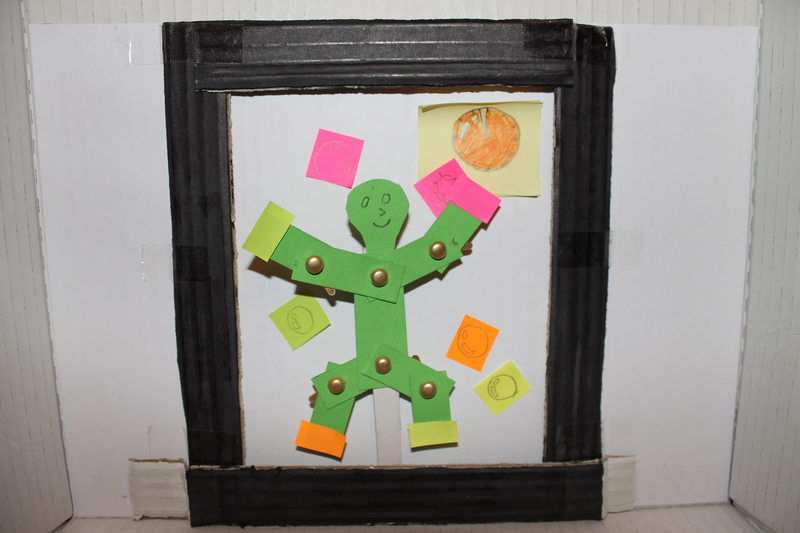 This week was all about giving our idea a physical shape. 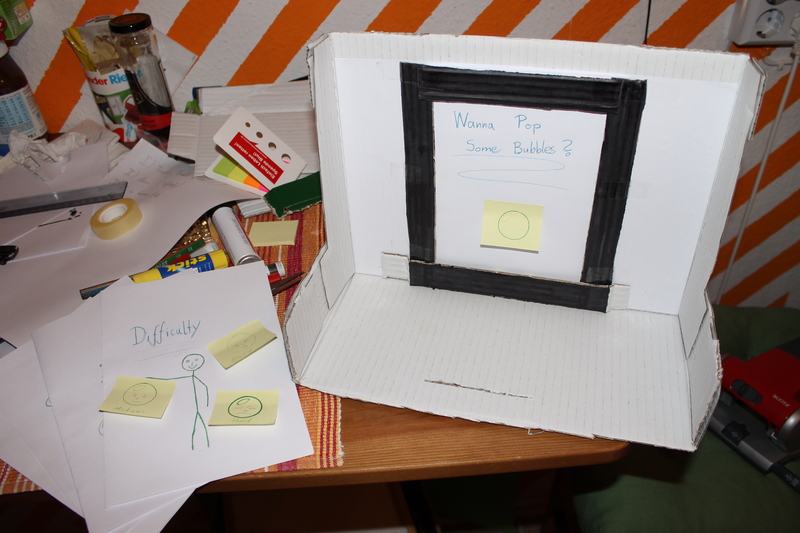 We built a paper prototype which enables us to show other people our application flow. Here are some impressions of our process. 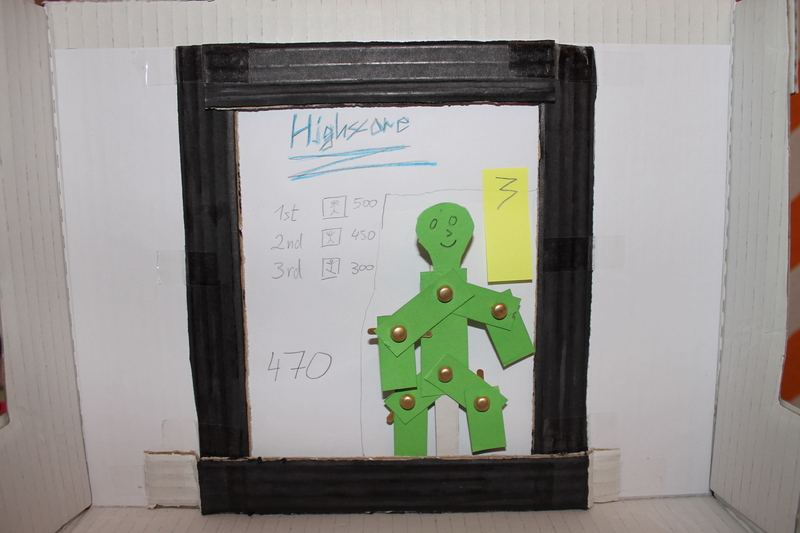 We used an old juice carton as a basis and created a frame that’s supposed to look like a typical display (advertisement window) at a bus stop. 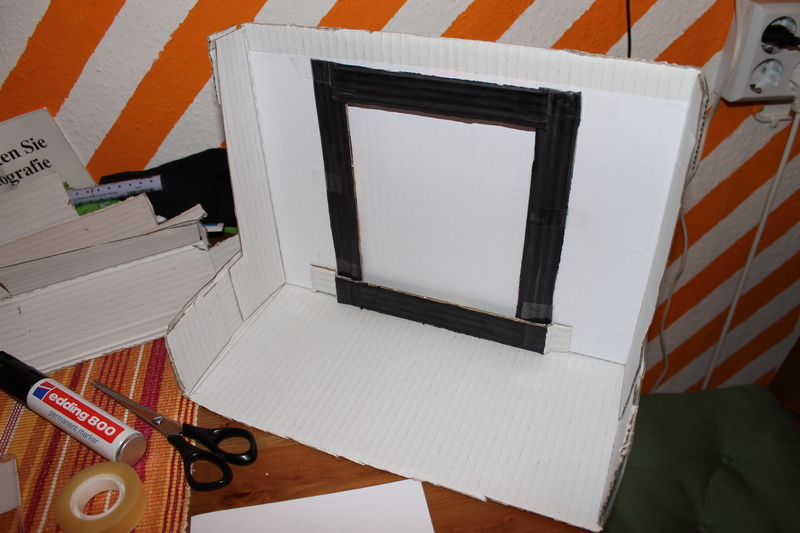 The frame is created in such a way, that we can change the displayed content by sliding in and out a screen from above. 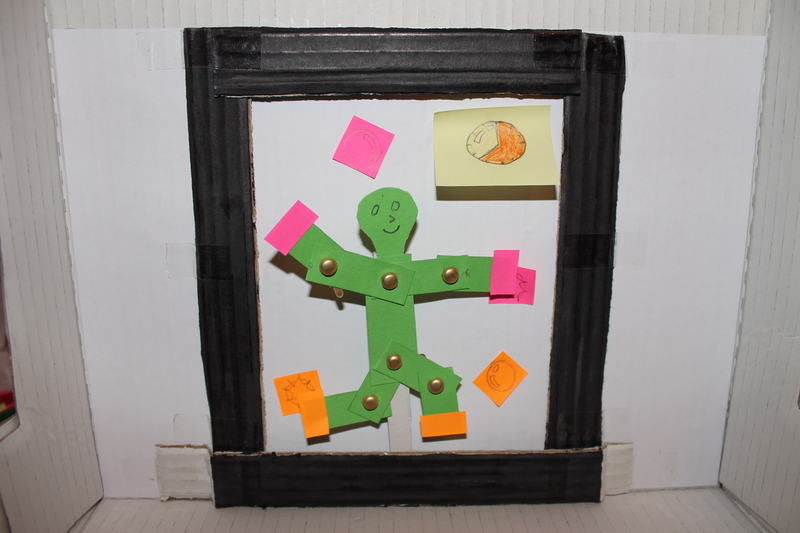 With pasteboard and Musterbeutelklammern (whatever the English word is :X) we built a movable stickman. 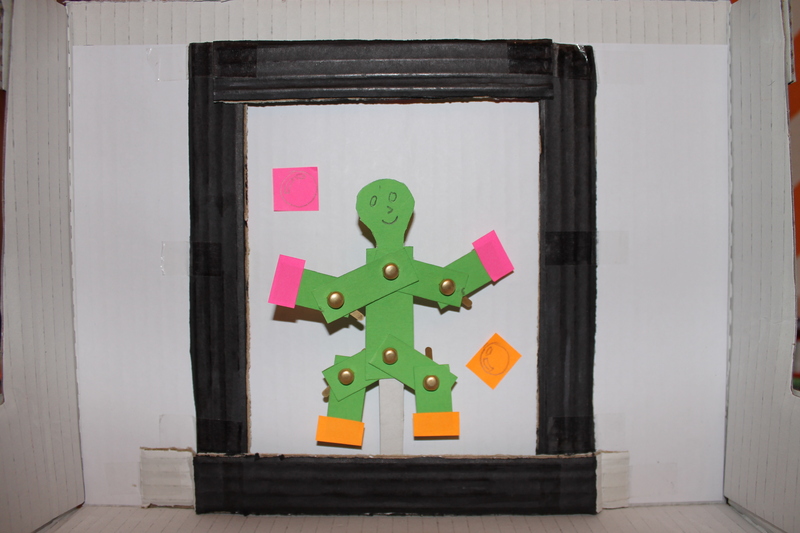 Afterwards we created the different screens and used post-its to be more flexible – e.g. the position of the bubbles is not fixed as they are floating around. 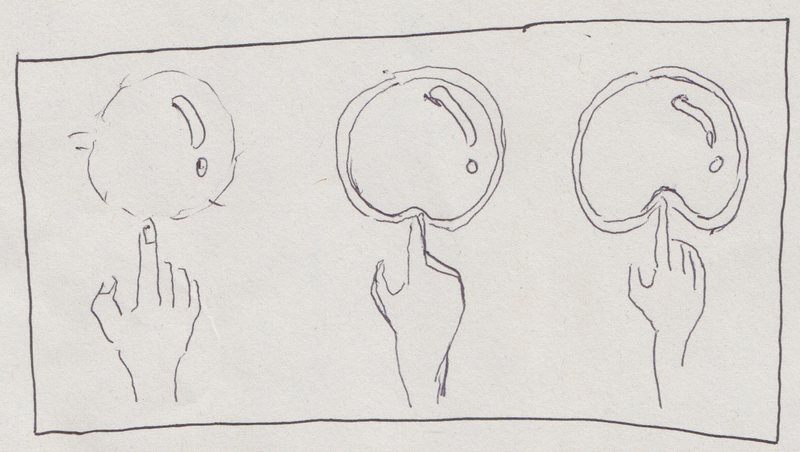 We start by using a moving bubble to win the user’s attention and to lure him closer to the screen. 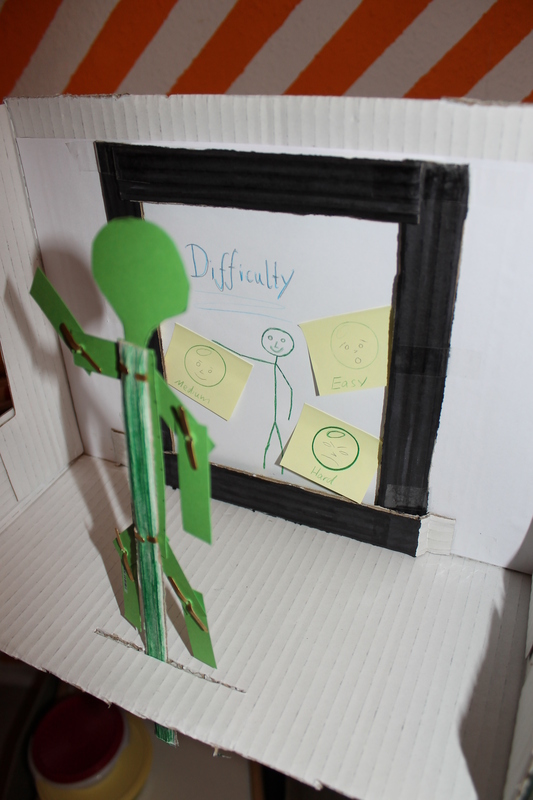 Once the user is close enough, he can select the difficulty he wants to play in. 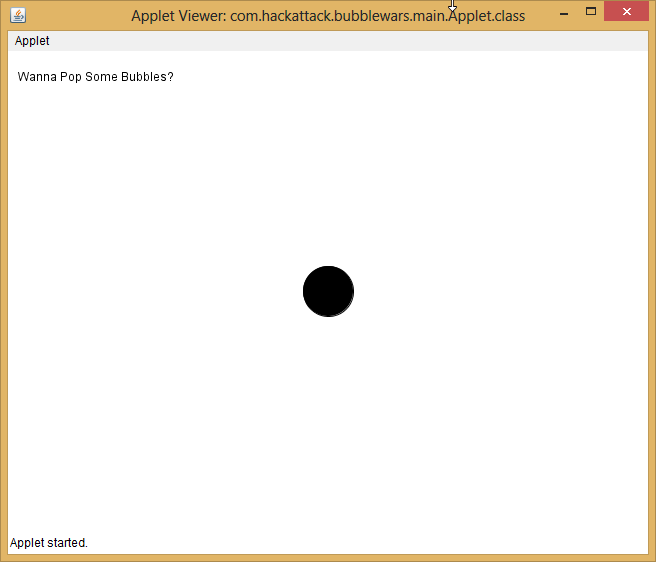 The game starts and the user gains points by destroying bubbles. 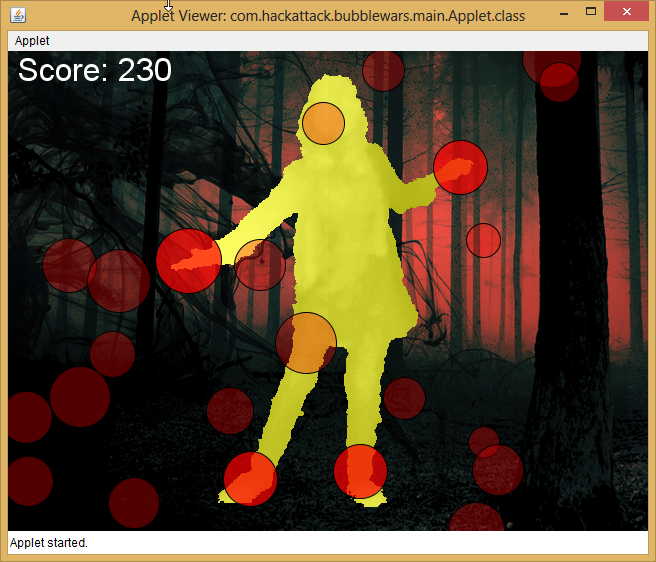 Over time bubbles spawn faster and once too many bubbles are on the screen, the user loses. 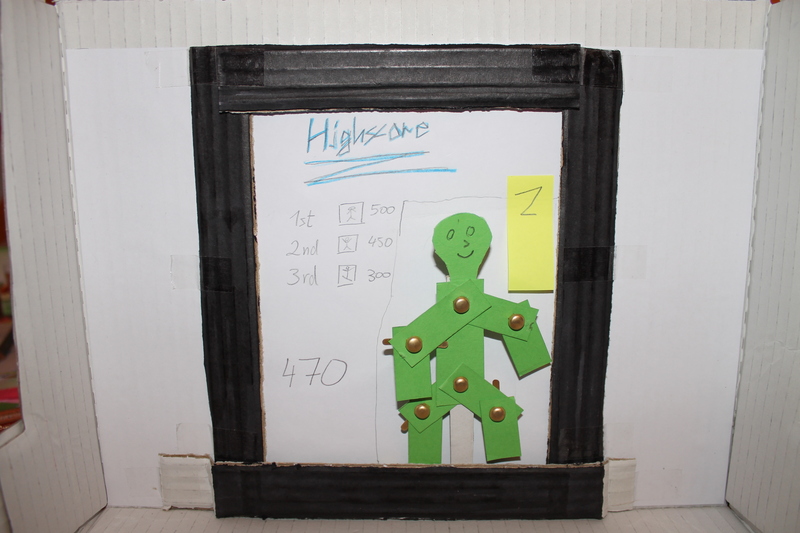 A final highscore screen gives the user the opportunity to take a picture of himself associated with his score. 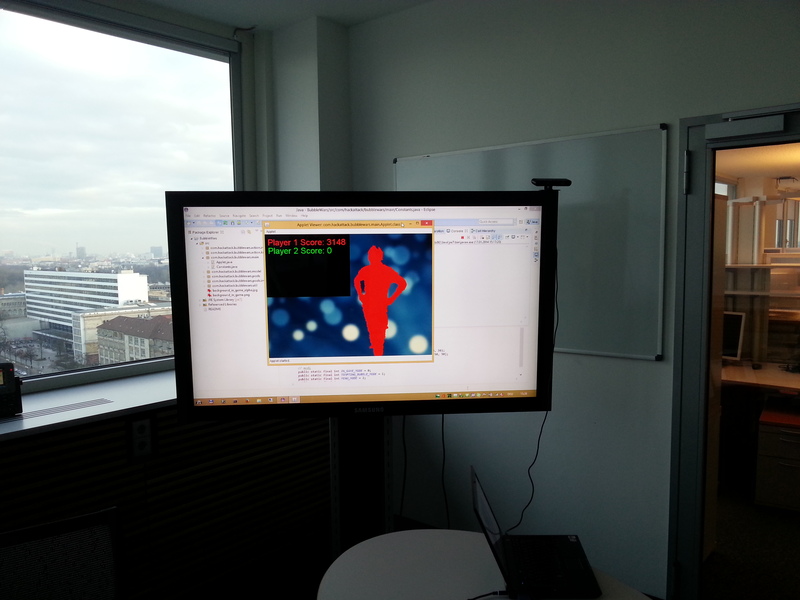 The user can initially interact with our application as he is approaching the screen. The user can select a difficulty. The user is playing the game. 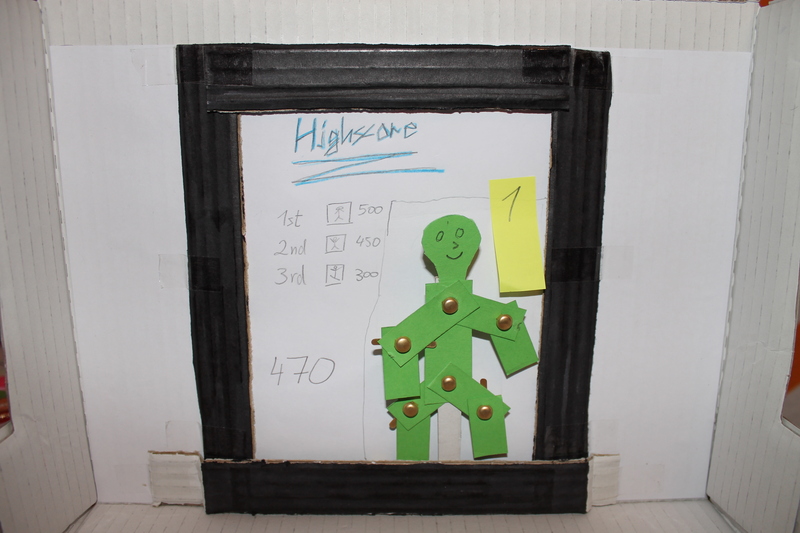 The user can take a picture for his highscore. All of these tasks are basically possible to proceed with, though in a primitive way. Next week we’re going to use our prototype to get some user feedback, so stay tuned. This time we actually had two weeks to do multiple things. 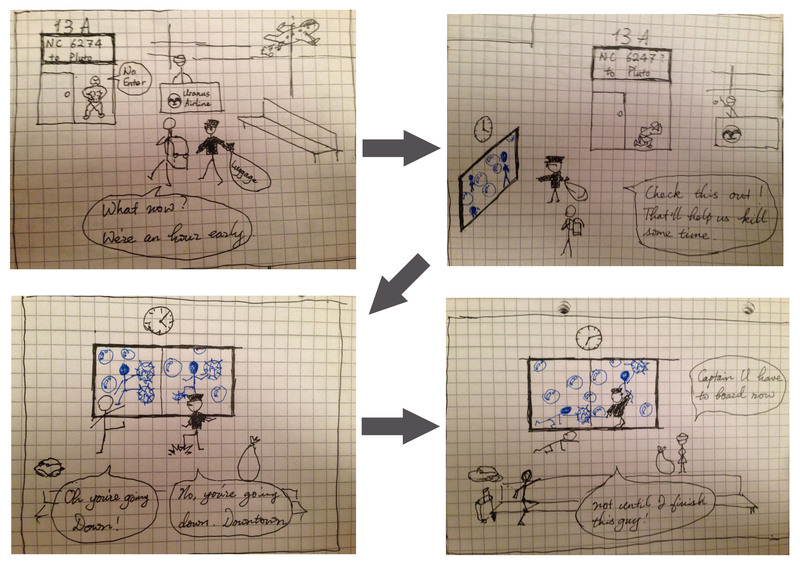 First we had to come up with two different storyboards, simply describing possible contexts of our application. The prototypical idea still is to make waiting more bearable, maybe even fun. So our first storyboard is placed at a bus stop, where you could play our game on one of the public displays. It’s not only waiting at a bus stop that’s annoying. If you are up to go on vacation and you’re waiting for your flight with your friend (or go to work as a pilot), you both could play the game to kill your time. As a second task we had to thought about interview questions that we could ask potential users (of our target group) to get some feedback on our brainstormed ideas and the storyboards. So the following part will describe our detailed interview agenda. 1. Hi, we are students of TU Berlin and we are working on a project regarding new interaction possibilities in known environments. We would like to do a little survey with you which will take about 30 minutes. Is this alright? 2. Do you mind if we record the conversation? 1. How do you usually go to work/school? – (by car/feet): Are you using public transport as well? 2. How long do you usually have to wait? 3. How long does it take you to become really annoyed? 4. If it takes long, how do you usually kill time? 5. What kinds of time-killer game do you suggest while waiting for the bus? 6. Would you be interested in some new ways of game interaction to kill your time? 7. Do you think in general people at your age are fast learners when it comes to games? 8. About how much time per week do you usually spend on playing games? 10. 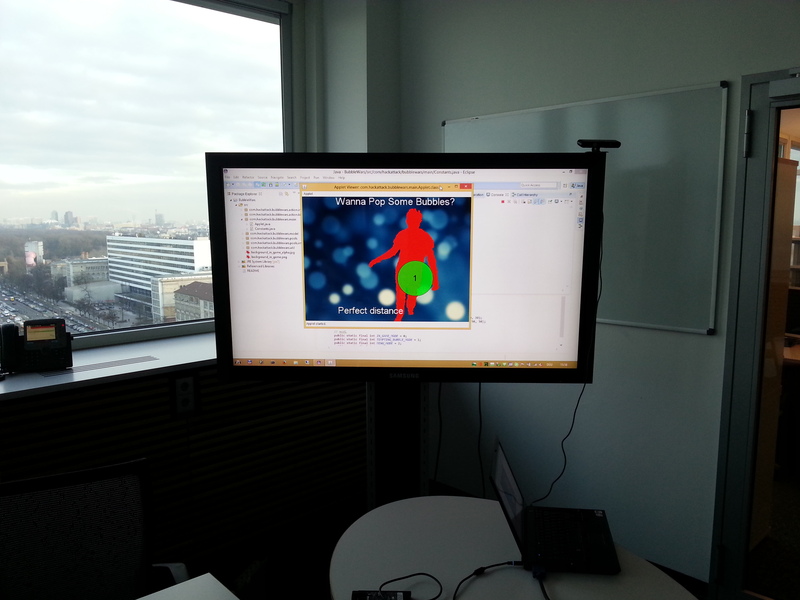 Do you have any experience with Microsoft Kinect or camera interaction in general? 0. 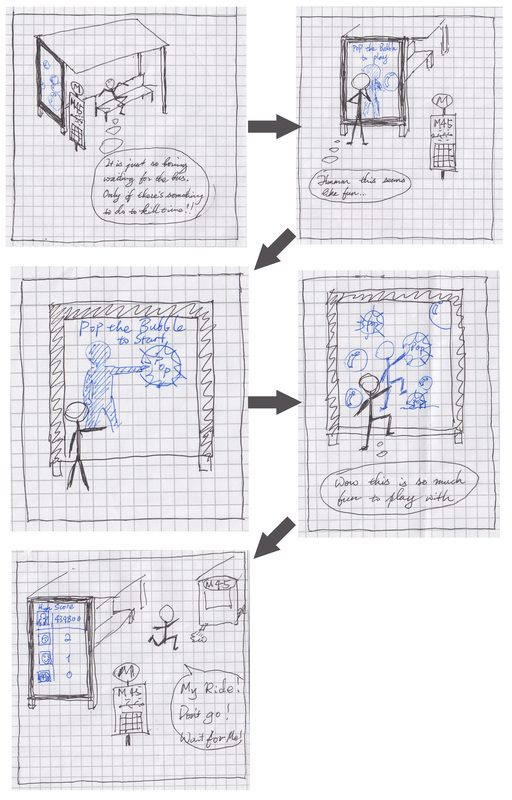 Explaining the idea, showing storyboard. 1. Can you imagine playing this game and if not why? 2. What do you think about the tempting bubble in the beginning to lure the player into the game? 5 .Can you imagine playing this with other people (also random people)? 6. Something you’d think we definitely should add? 7. Would you recommend this game to your friends, if it is available? **Besides the problem of chosing different levels of difficulty the even more important question is how to acutally pop a bubble. 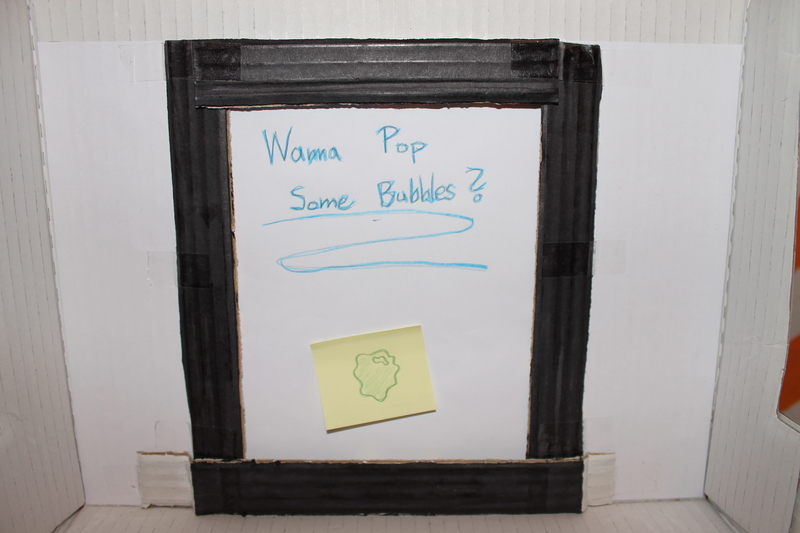 Does it have to be really close to pop a bubble wrap or is it sufficient to pop it just like an air bubble? Neo is 25 and studies Computer Engineering at TU Zion. When he doesn’t want to fly to university he takes public transport. Trinity is 23 and probably the best Spanish teacher in Zion. She has to take public transport every day to get to work. Morpheus is 25 and studies Computer Engineering as well. To find the wisdom of the Oracle he has to take the bus every day. They all own a smartphone, are socially well connected and public transport professionals. How to destroy the bubble? 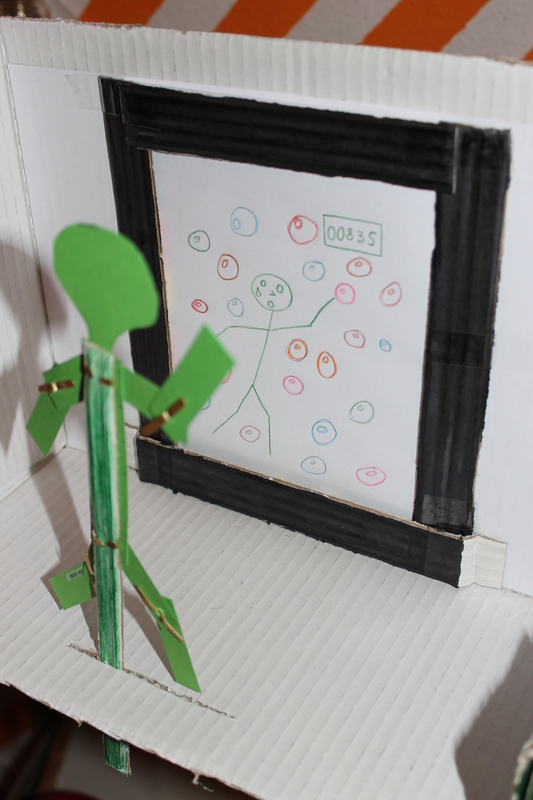 When asking the interviewees about the best method of popping the bubbles, all of them came up with the idea of switching the method from time to time, in order to make the game more fun. If they had to choose only one, the opinions on which method would work best for them varied from person to person. 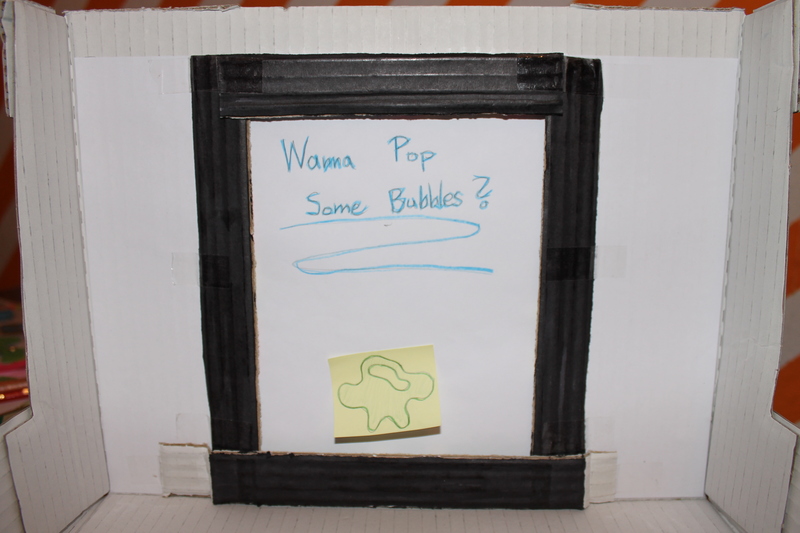 The interviewees liked the idea of having a bubble in the primary stage of the interaction to lure the user into the game. One interviewee mentioned to be very careful on how this bubble interacts with the user, to not be mistaken with advertisement. Further all interviewees liked the idea of choosing the difficulty level via bubbles differing in quality (like thickness). In terms of understanding the game quickly, no one showed doubts that other people his/her age would be able to grasp the basic idea behind the game quickly. Do I really want to move funny in front of strangers? Would the screen be too chaotic, so that proper game interaction would become more difficult? Our game should be intuitive and diverting. 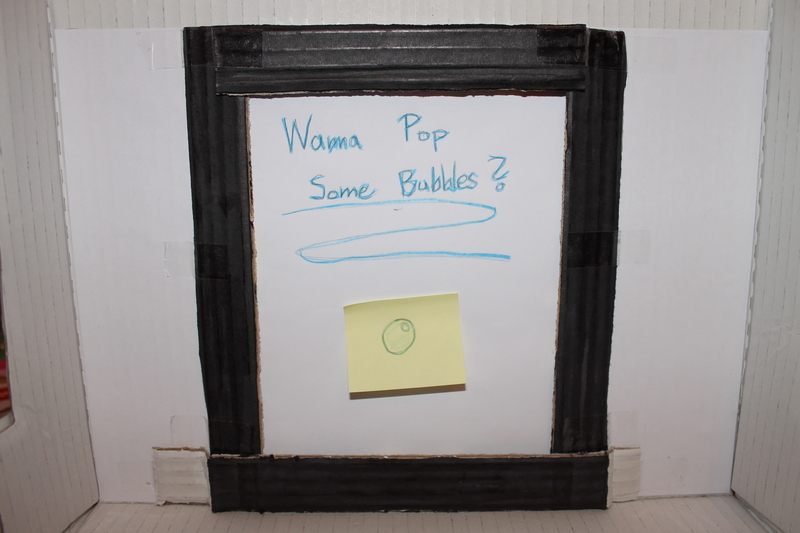 Popping a bubble should be possible in multiple ways to prevent boredom even after several rounds. The game has to be recognized as one and not to be confused with an advertisement. Let’s be honest – everybody likes bubble wraps, those tiny little buttons you liked to pop when you were a child. After years of protests of environmentalists against all those bubble wrap rolls at every bus stop in the city (obviously wasting plastic for no reason), we found a solution – Bubble Wars. 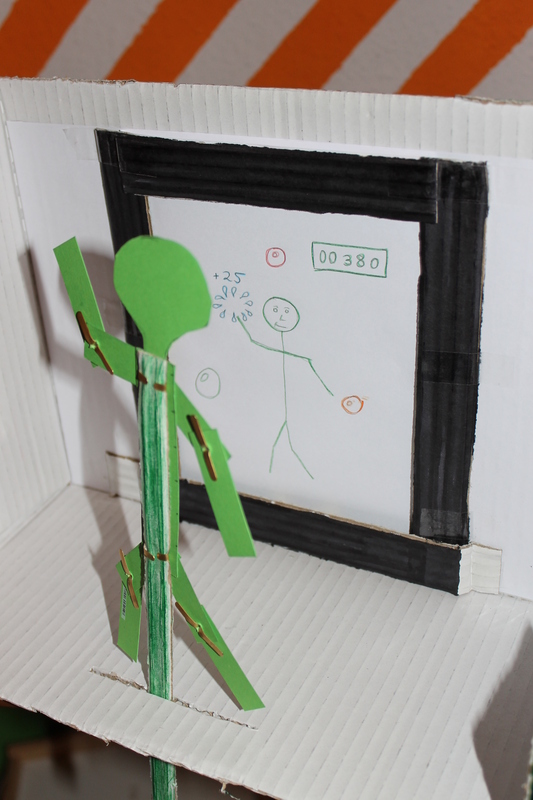 It’s an interactive game you can play on any public display. 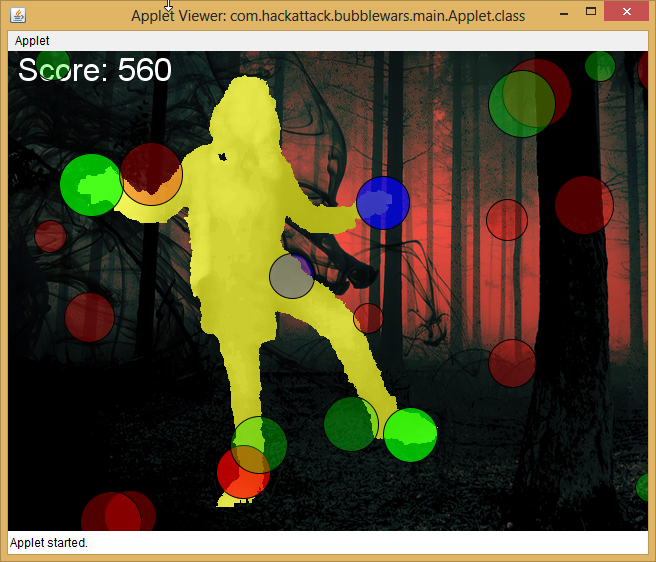 The idea is to pop all bubbles to clear the game field. If you are not fast enough the bubbles will return and delay your victory. You can pop the bubbles with your hands and feet by touching them. It is even possible to play with multiple players. Some of your popped bubbles will reappear on your opponents game field. Can you withstand the bubble invasion? Accept the challenge and do not let them get the upper hand! 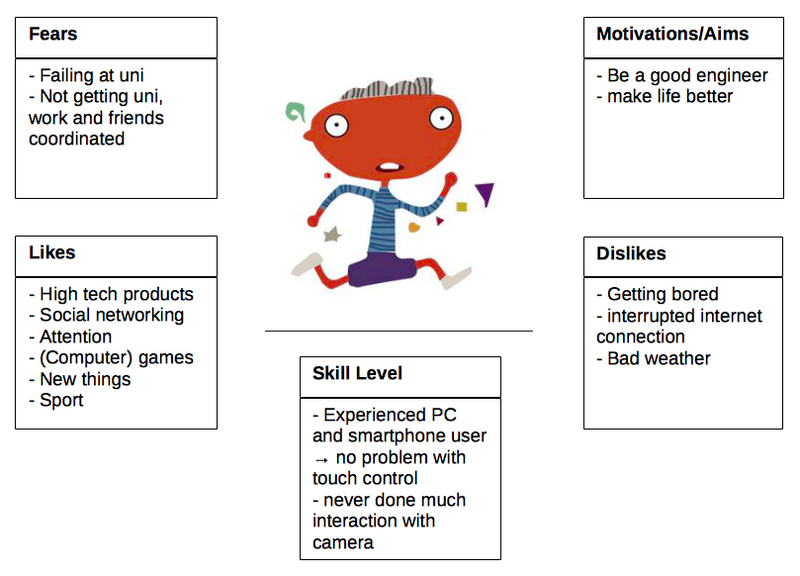 This will be a blog about a project we are doing for the course Mobile and Physical Interaction at TU Berlin during winter term 2013/14. It will develop over the semester showing our process with the task, which will be an interactive application for a public display. So stay tuned (or turn off, if we’re finished).